“This is actually an update of a vintage crochet pattern from many years ago. When my husband and I got married nearly 8 years ago we had to have a “Chuppah,” a wedding canopy that is required for a Jewish ceremony. We knew we wanted something special and decided to make one together as a couple. This was when I discovered that my husband could crochet. He learned in 4th grade and still remembered how to do it, although it had been many years since he had picked up yarn and a hook (since the 4th grade actually). “So we sifted through the many crochet books and magazines that my great-aunts had in their stash and we went to work modifying it for our needs. 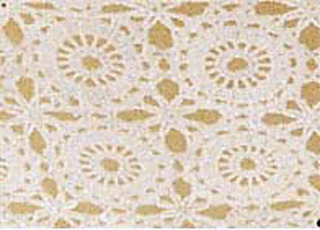 We first thought that we would use crochet thread to create our Chuppah (as the pattern called for) but while my husband was a pro with the small hook and thin thread, I was a disaster. It was just too small for my hands to work with. We then moved up to worsted weight yarn and went to work. 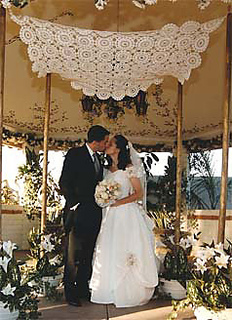 “The Chuppah that we made has served as a wedding canopy for us and for my mother when she got re-married. It also just took a very important role as a baby blanket when my son was brought in for his Bris when he was just 8 days old. We hope to be able to pass this heirloom down for generations to come and that it can continue to take an important role in our family’s lifecycle events. you’ll also need a tapestry needle.